Ecuador’s President Lenin Moreno has indicated that the country will consider joining the Trans-Pacific Partnership free trade agreement while seeking diversification of its trade and industry. Moreno gave an interview to NHK in Tokyo on Thursday. He is visiting Japan to commemorate the 100th anniversary of the establishment of diplomatic ties between the 2 countries. He indicated he will promote diversification of Ecuador’s trade and industry, a shift from policies of the previous left-wing administration. He said his country has decided to make a 180-degree turn in its economic policies. The president said he wants to renew the country’s relations with its trade partners, and that TPP would be a good choice in terms of investment. He also referred to WikiLeaks founder Julian Assange, who has been living in Ecuador’s London embassy for more than 6 years. Assange was arrested by British police in London in 2010 in connection with allegations of sexual assault and other offenses in Sweden. He was granted asylum at the Ecuadorian Embassy in London while he was out on bail in 2012. Moreno said it’s not good from the viewpoint of human rights that Assange has been in the embassy for a long period as a refugee. The president revealed that negotiations are underway with Assange’s representative and the British government on his deportation. Moreno said the British government promised not to hand over Assange to a country where his life could be in danger. 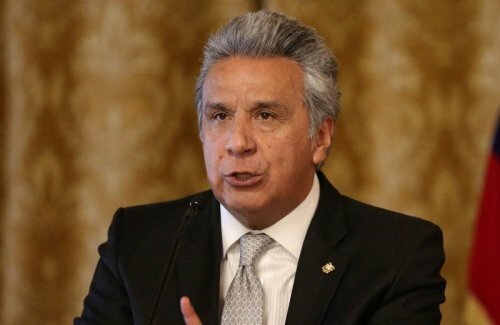 He indicated Ecuador’s government will seek an early resolution of the issue with Assange’s safety as the top priority.